And you can learn how to pilot one in less than an hour. Nothing screams “the future” more than the promise of flying cars. Many a driver, stuck in horribly gridlocked traffic, has dreamed of the day when she’ll be able to skip over all this mess and take to the sky. Now, we may no longer be stuck with aspirational drawings of “skyports” or super distant timelines (are Uber’s flying taxis coming in a decade or in two years? which is it?). Kitty Hawk, Larry Page’s flying car project, recently completed a test flight. But it wasn’t just any old test flight — CNN reporter and definitely-not-a-trained-pilot Rachel Crane was the one in the cockpit. Admittedly, her flight wasn’t all that impressive: she piloted Kitty Hawk’s Flyer for five minutes at about 10 kilometers per hour (6 miles per hour) and about three meters (ten feet) over a body of water (in the name of safety). But! Crane was able to get the hang of the minimalist two-joystick controls after a training session that lasted less than an hour. While the test flight shows we’re not exactly ready for a traffic-dodging future here, it does indicate that future pilots won’t need years of training to safely pilot a flying car, when they get the chance to do so. 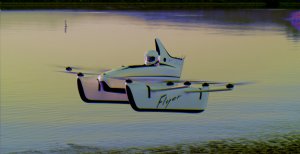 Driving a flying car could be as simple as — or even simpler than — driving a car. Kitty Hawk’s Flyer is a recreational vehicle — it won’t replace your family sedan any time soon. Despite the vehicle’s small size, the lithium polymer battery that powers it lasts only for about 20 minutes. There are still major regulatory and infrastructure hurdles, such as the establishment of air traffic control systems, and vehicle safety standards. Even though it’s exciting to drive a flying car, it might be a long road for the public to accept the vehicles overall (they’re kind of flying death traps, are they not?). Lead engineer Todd Reichert says that the Flyer is just the beginning of a larger plan to eliminate traffic on the ground entirely. “We’re on sort of a story arc from recreation, to exploration, to transportation, and we will have to evolve along the way,” he tells Crane in the CNN segment. But Kitty Hawk has other plans to dominate the skies. Another aircraft, called Cora, is probably more of what you’d picture when someone says “flying car.” It’s a two-seater electric aircraft, intended to be used as a flying taxi (not personal vehicle) in cities. But so far, details about its release date and cost are sparse, if not non-existent. The day in which we might all be able to ride in flying cars feels closer than ever. But, the truth is, we don’t really know for sure. Kitty Hawk seems to be answering some of the questions about how we’ll ride in these vehicles. Now, the question that remains, is when.